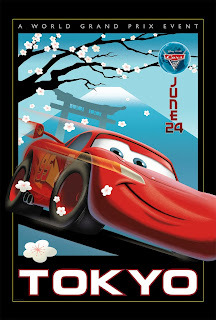 Yahoo was nice enough to rate the Cars 2 Posters I got to work on as one of the summer's best film posters. It's always awesome to get noticed and I'm just relieved that it wasn't in the '5 worst' list. In all honesty, I kind of like the Harry Potter poster, even thought it was on the 'worst' list). Thanks to Ricardo and Sue for the heads up. To check out the rest of the list CLICK HERE!